A collection of historic 19th and 20th century paintings of Shoreham many of which are still held by local collectors. Views are revealed that inspired the artists then as well as a taste of things as they once were. 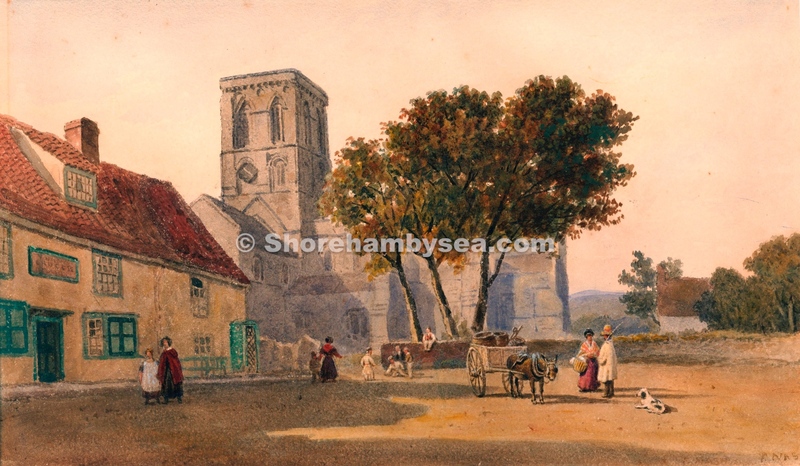 Believed to be the work of George Cattermole (1800 – 1868) a member of the Royal Watercolour Society who later moved on to oils as his medium. He was awarded a first class gold medal at the Paris Exhibtion in 1855 as well as enjoying professional honours in Amsterdam and Belgium. 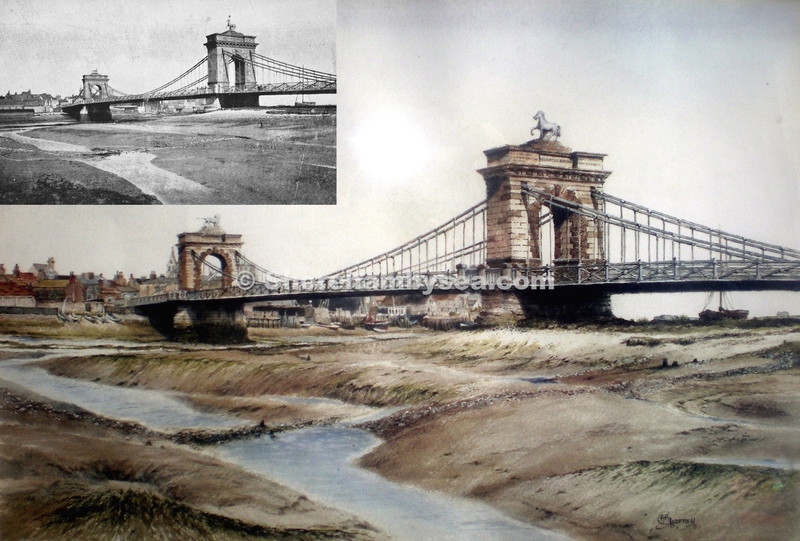 This particular painting, a watercolour, was drawn on or near the then four year old suspension bridge. 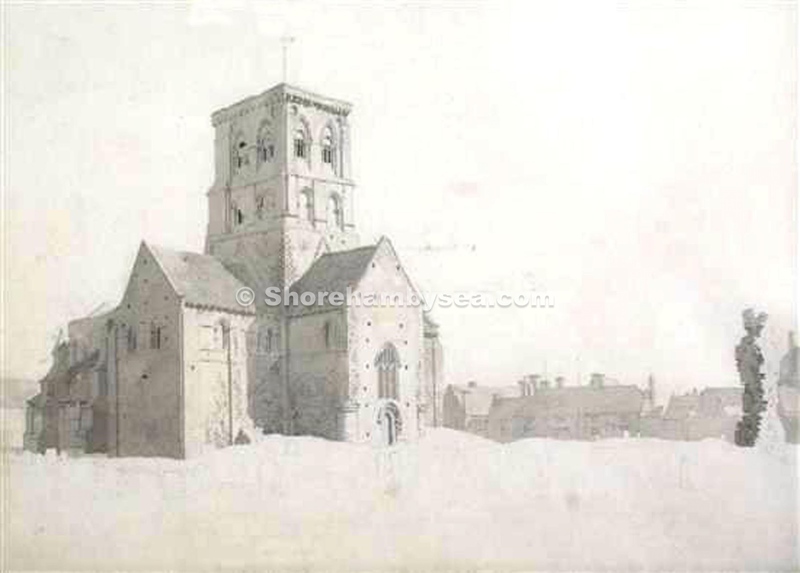 It is of particular interest to local historians as it is probably one of the most distinct and architecturally accurate illustrations of Shoreham buildings of the period and clearly reflects Cattermole’s earlier training as an architectural and topographical draughtsman. 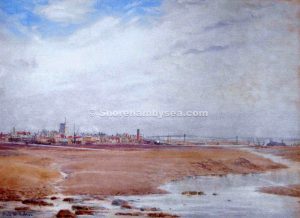 This watercolour was painted by John Wright Oakes, ARA (1820 p-1887) a Liverpool landscape artist who began exhibiting his work in 1839 and continued on to the Royal Academy from 1848 to 1888. His paintings are naturalistic although he often attempted Turneresque effects of light and sky. 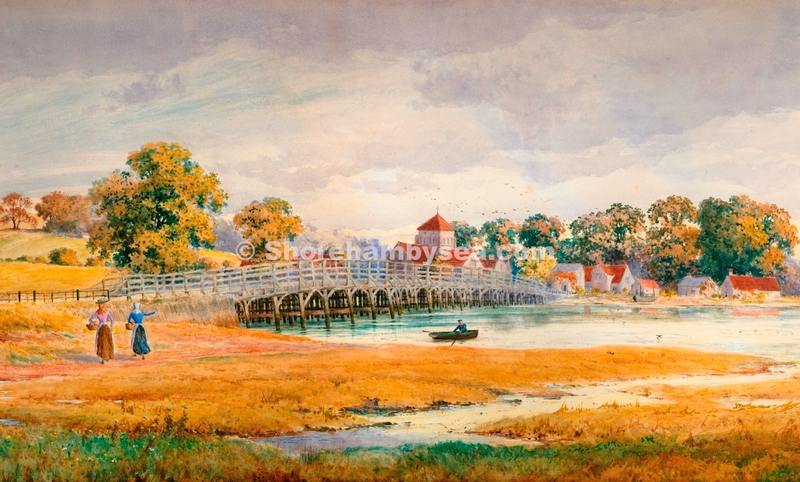 St.Nicolas church and the Toll Bridge are prominent in this painting and beneath the former can just be seen part of the Red Lion Inn and the toll keeper’s cottage. To the left are the trees and fields where the edge of the airfield is now and the banks on both sides of the river appear to be in their more natural state before the earth ‘walls’ of later years were thrown up to protect the surrounding land from flooding. To the right are cottages that no longer exist and, even allowing for artistic licence, the bridge itself is showing its original type of 18th century construction. 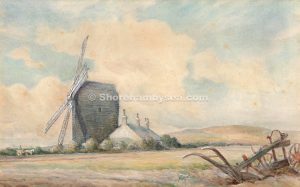 With a little difficulty it is just possible to make out the windmill on Mill Hill. Unfortunately for purists, Oakes has applied a Turneresque influence to this that gives it an almost ethereal look but leaves it indistinct and easily missed by the viewer. Alfred Bennett (fl. 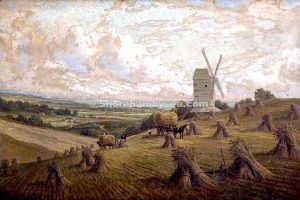 1861 – 1916) was a landscape painter who exhibited at the Royal Academy, the British Institution and the Society of British Artists. He lived in London but later moved to Knebworth in Hertfordshire. 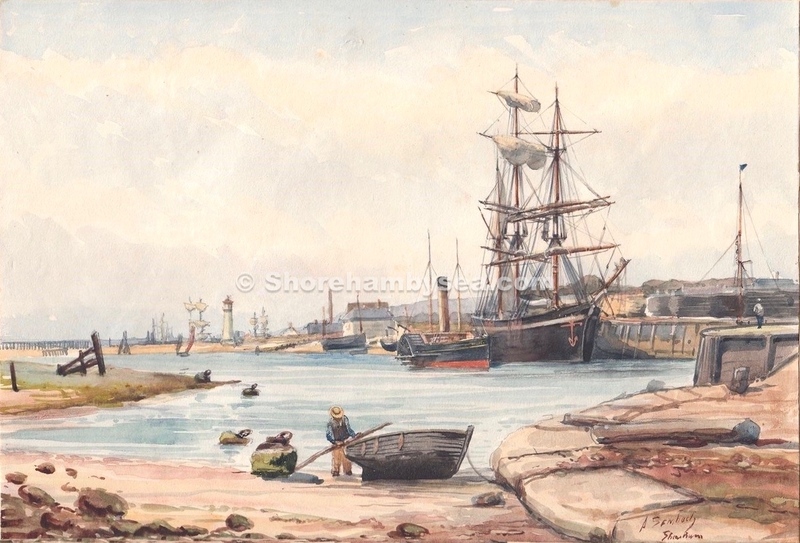 As it’s title suggests this picture looks from the River Adur’s south bank where the ferry once plied northwards towards the town (the ferry’s route normally took passengers from this point diagonally across towards the left side of the ship on the stocks to the opposite bank at the bottom of East Street). 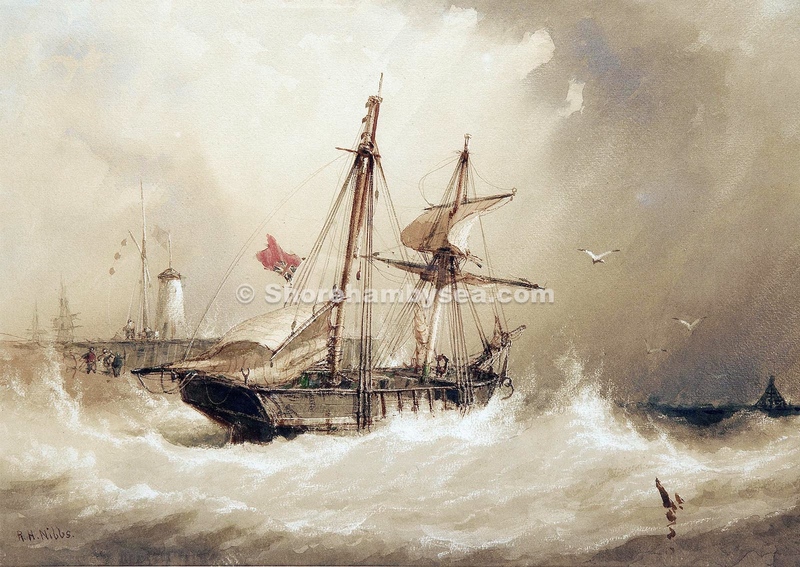 The ship is probably not a new vessel as the last to be built at Shoreham was the Osman Pasha by Dyer & Son in 1878, nine years before the painting so was probably being repaired or overhauled. 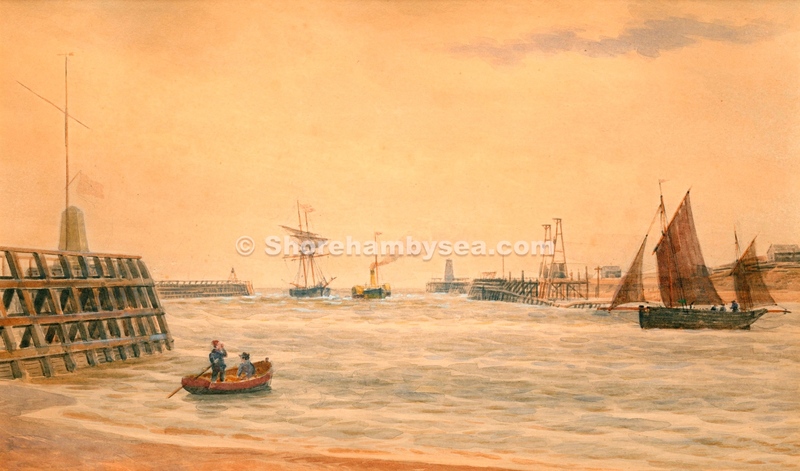 The timbered wharf seen immediately opposite was then Dyer’s shipyard but is now the Sussex Yacht Club site. 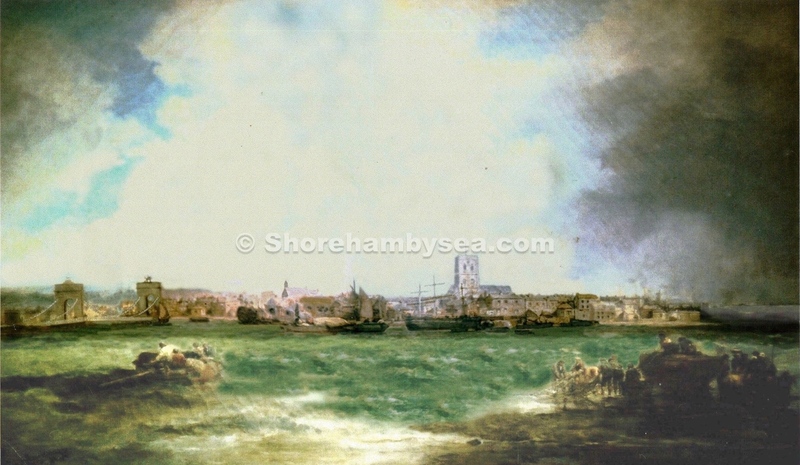 From the right side of the moored ship across the front of the church are the backs of the buildings in East Street and just under the extreme right of the church can be seen the top half of the National School which now houses St.Mary’s Church Hall. 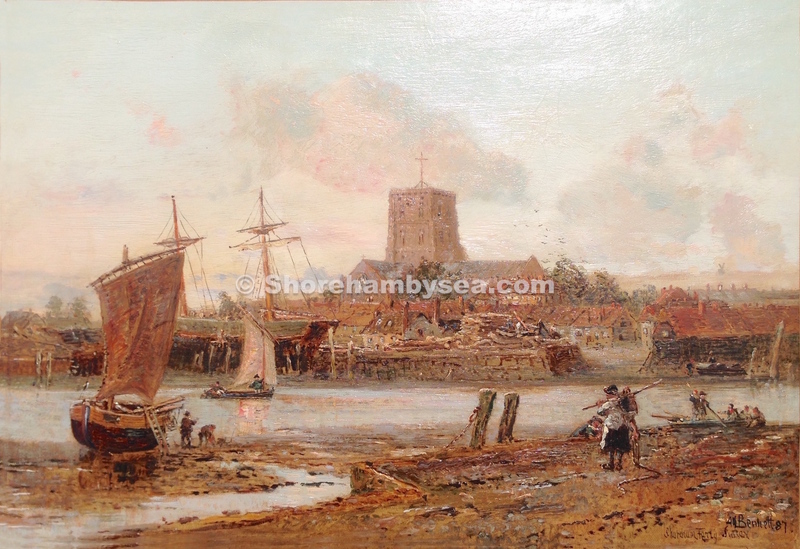 Through the gap in the timbered wharf are the easternmost of four coastguard cottages that once stood in the area now occupied by a garage and in the far distance the Mill Hill windmill can just be made out. 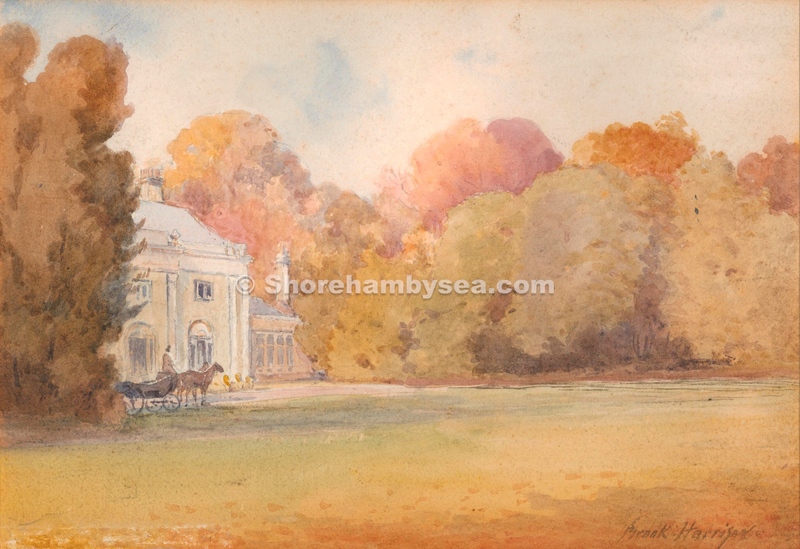 Painted by Alice Mary Hobson RI (1860 – 1954) the owner dates this from between 1915 to 1920. 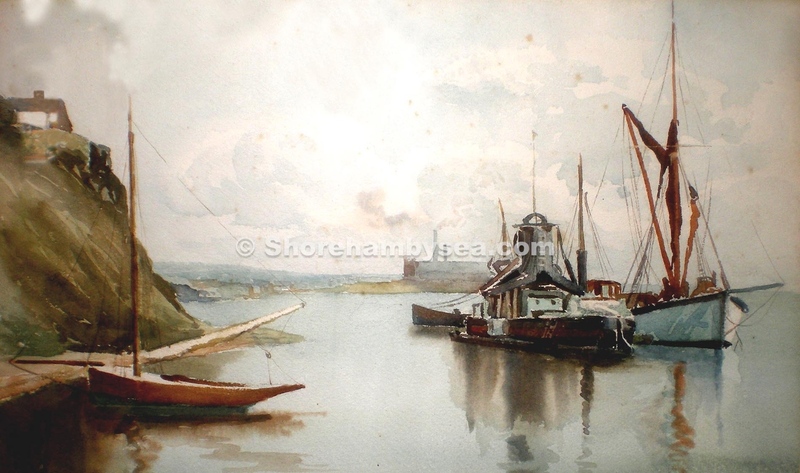 Artist Frederick James Aldridge (1849 – 1933) needs little introduction to those interested in Shoreham’s local art. 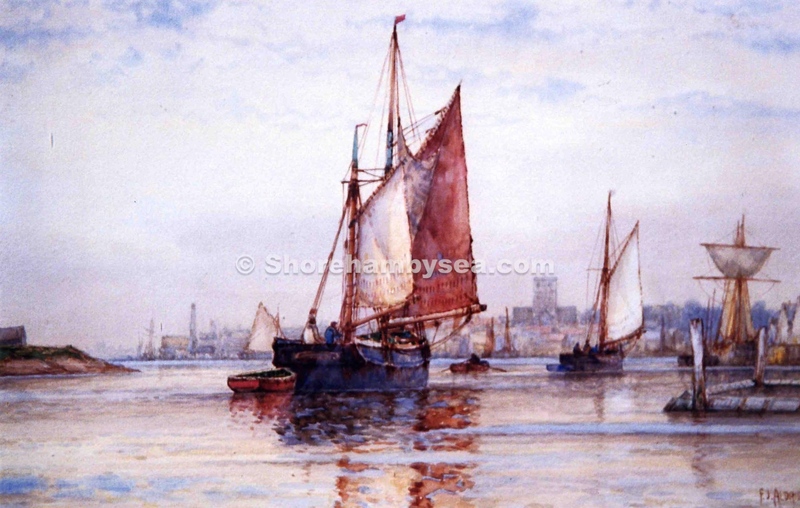 He was a marine artist, chiefly in watercolour and exhibited at the principal London galleries from 1880 onwards. 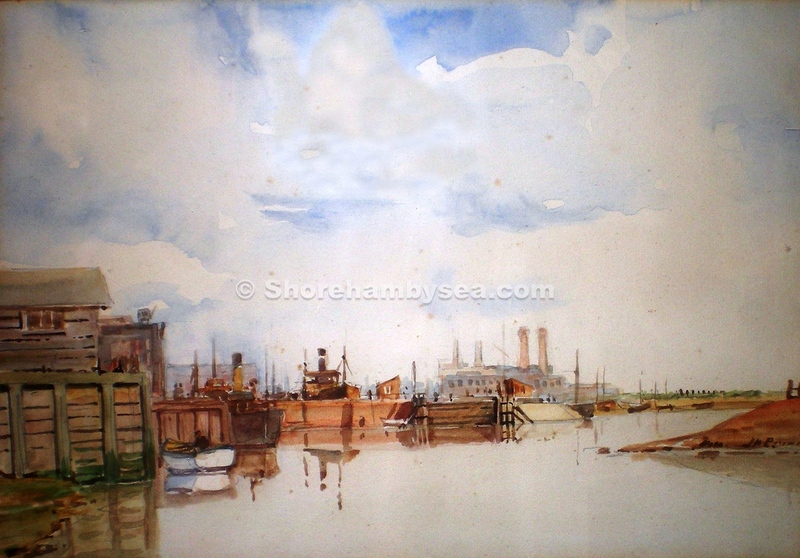 He lived in Worthing for many years and was associated with the firm of fine art dealers ‘Aldridges’ of Worthing. The painting shows a sailing barge on the left, probably laden with shingle dredged from the harbour bar proceeding upstream. 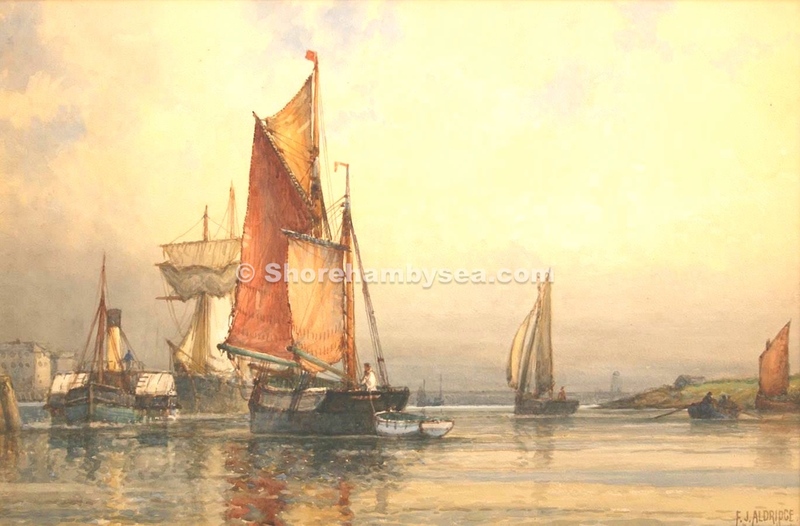 A little further on in mid stream is an oyster ketch and on the extreme right is moored a top-sail schooner engaged in the coastal trade. 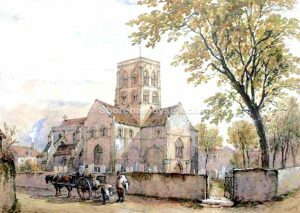 The townscape includes the well known landmark of the brewery chimney at the western end of what is now Coronation Green and, of course, St.Mary’s church. These two charming scenes were painted by local artist Richard Steers during the 1960’s/70’s. By his own admission some of the buildings shown are not totally accurate in scale but without doubt they provide a wonderful flavour of how the town looked then. 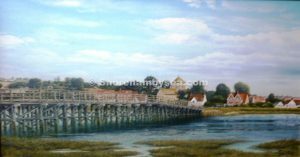 B8 The Old Toll Bridge was painted by Aubrey Willett resident of Shoreham, in 1994. B11 This picture of Lancing College and Chapel was painted in 1992 by Aubrey Willett a Shoreham resident. B13 This painting of the town around and beyond the Coronation Green area is a high quality, precise record of the scene in 1880 when it was painted by Brook Harrison (1860 – 1930). 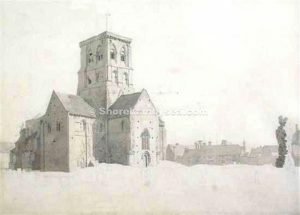 His full name was Brooking Alfred Wrankmore Harrison (he was descended from the Wrankmore and Butler families of Shoreham) and lived in Shoreham for many years. 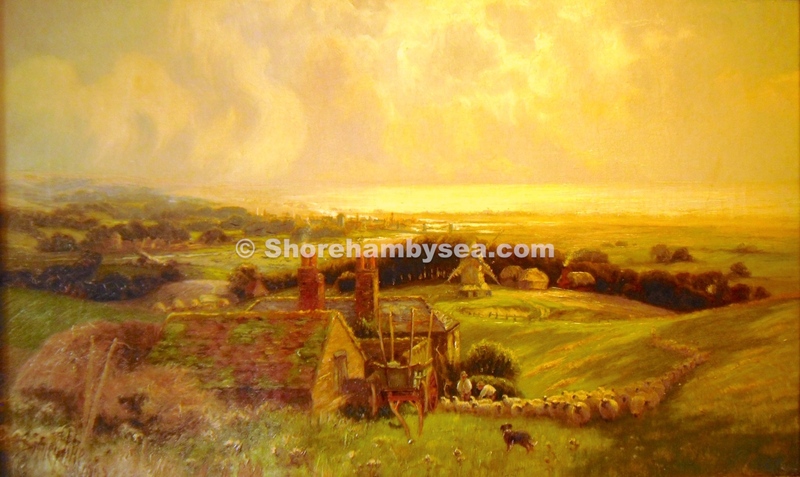 He painted many Sussex scenes and exhibited his work at the R.B.A. in London, Brighton Art Club and Society of Sussex Artists. 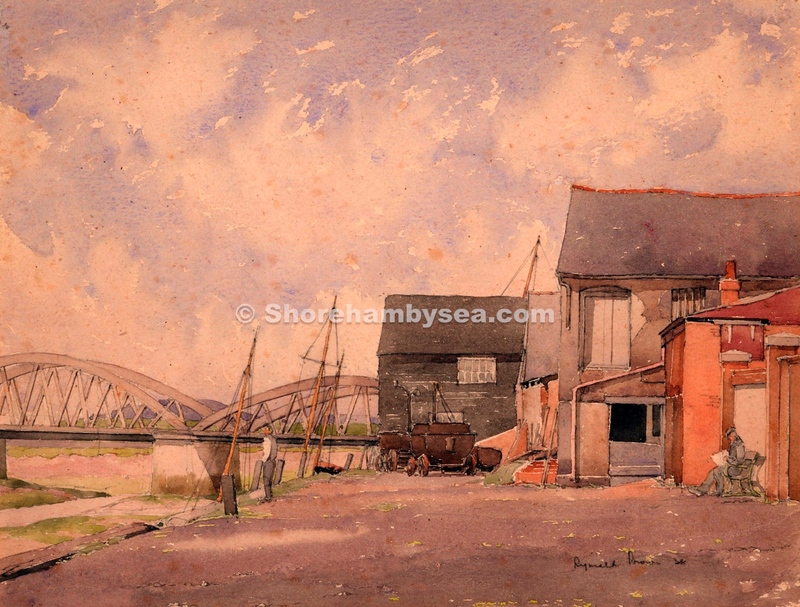 Some 200 of his paintings survived him and many still remain in Shoreham. B14 A charming watercolour of the Dolphin Hard and Dolphin Inn painted in 1909 by Thomas Butler Stoney. To date little has been found regarding this artist except that he exhibited from 1899 to 1912 – perhaps others may know more? 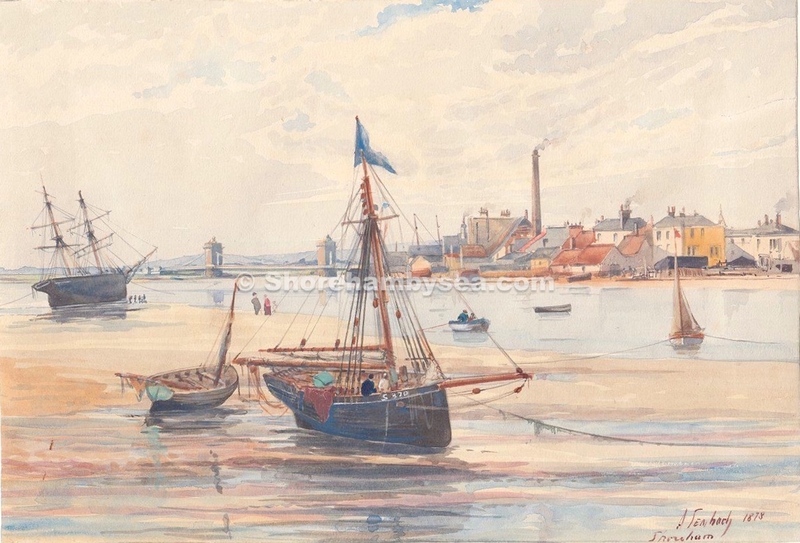 B16 Undated, this Powell painting shows a beached sailing barge on the river edge with St.Mary’s in the distance. 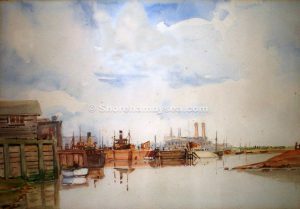 B17 Undated, a view by Powell of the canal from Southwick towards the power station. B18 Undated, but thought to be Powell’s work and shows the canal towards Portslade from Southwick. 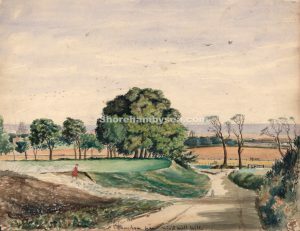 B19 Again an undated painting of Powell’s and shows the Coronation Green area with Stone House and the bridge beyond. 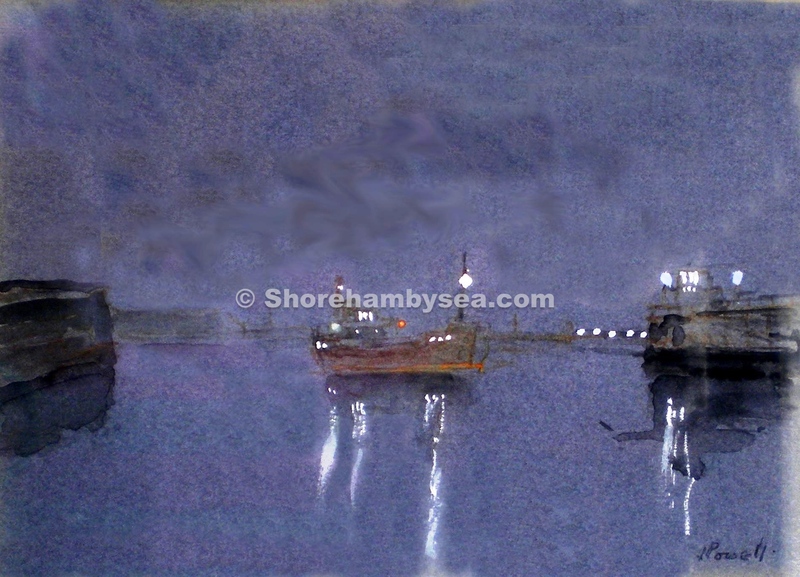 B20 A night view of the harbour, simple yet striking, dashed off in a few minutes by Powell for the current owner. 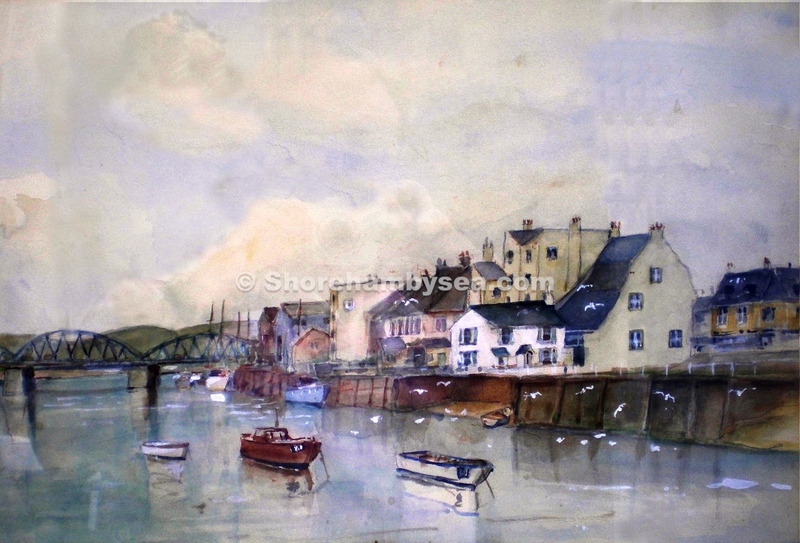 He was then in a nursing home nearing the end of his life (1974) but still enjoyed painting to give himself extra pocket money – this one cost £5. 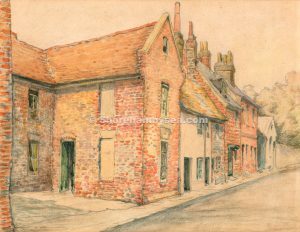 B21 One to interest the local historians is this almost architectural drawing executed with obvious precision recording the Dolphin Hard area in 1932 and finished in watercolour. The footbridge can just be seen to the left and beyond it East Street with the Ferry Inn on the left and East Street Arms (right). St.Mary’s church tower is shown in good detail. 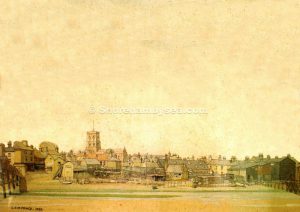 From an artistic point of view the townscape sits low down in the painting beneath a large expanse of featureless sky – yet for all that the picture overall provides a striking and pleasing effect. 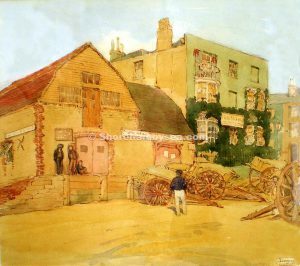 Have not been able to find out much about the artist, Louis S.M.Prince, other than he was an associate of the Royal College of Art and a staff inspector (whatever that was) for the London College of Communications. 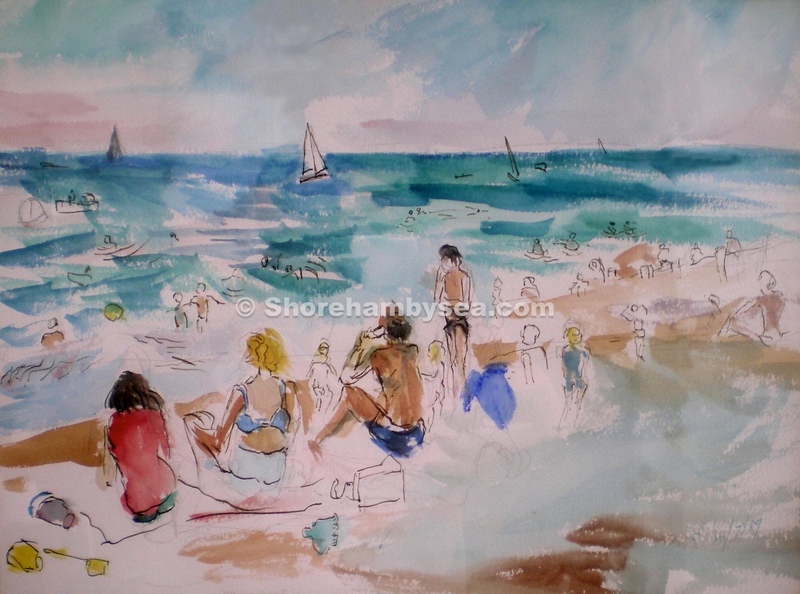 I notice that his paintings are still selling here and in America – perhaps someone knows more of him? 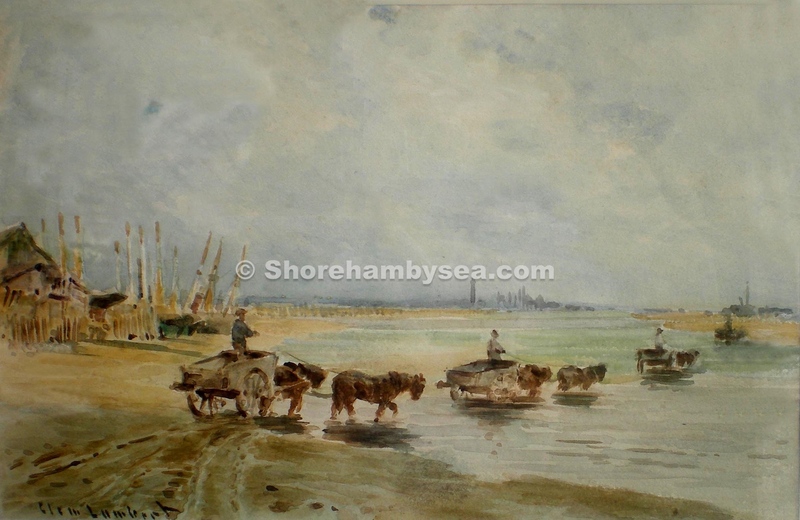 B23 During the second half of the last century A.A.Godfrey was a well known local artist who painted early 20th century Shoreham views, boats, etc., and many prints of his work can still be seen in pubs, bars and homes throughout Shoreham. 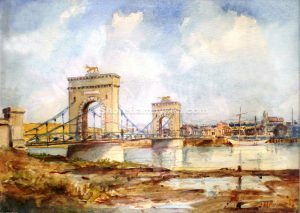 It was said that he used old postcards for his paintings and looking at the SBS galleries there is one that matches his work of the Norfolk Suspension Bridge. Does anyone know of any other postcards that match his paintings? B26 Clem Lambert 1854- 1925 a painter who painted much in the Brighton area. 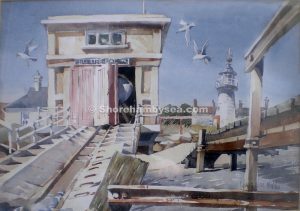 Known for his landscapes and sea scapes as well as his pictures of Brighton. 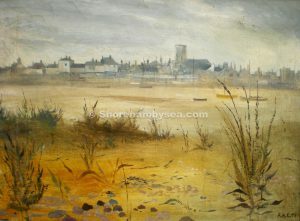 He wasfor many years onthe Brighton Fine Art Committee. 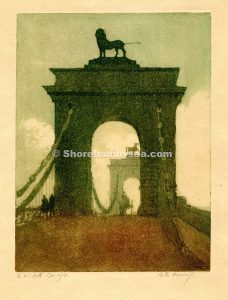 He exhibited widely from 1880 including this. B28 Phylis Pearsall 1906 – 1996 . 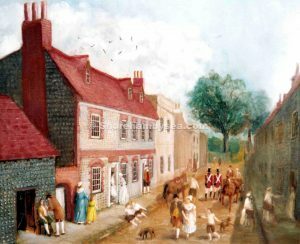 In the 1930’s a portrait painter then conceived the idea of mapping the whole of London which she did, it is said, by personally walking 3,000 miles of the 23,000 streets of the city. This resulted in the now famous London A – Z map. During WW2 she worked for the Ministry of Information drawing women in factories. Her A – Z map continued its’ success after the war and was awarded the MBE. 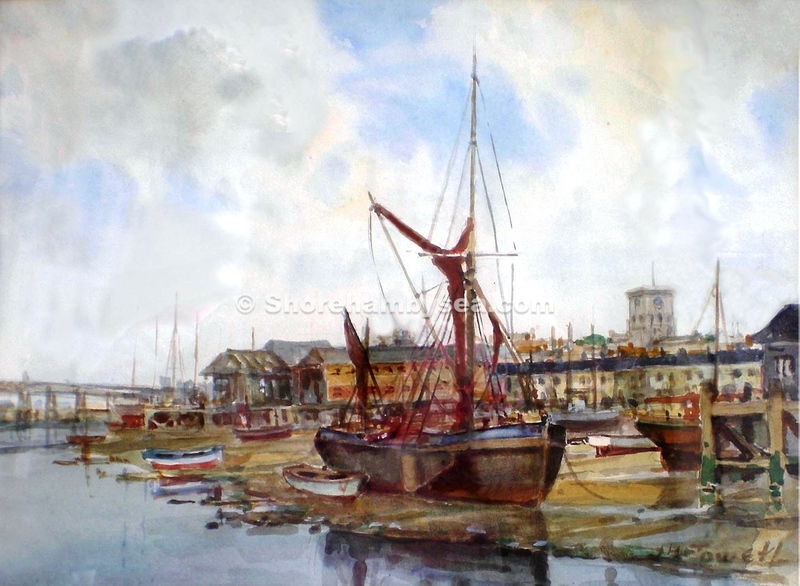 In her later years she lived in Shoreham and continued to paint for her own pleasure and this is one of them. B37 Swiss Gardens, Shoreham-by-Sea. 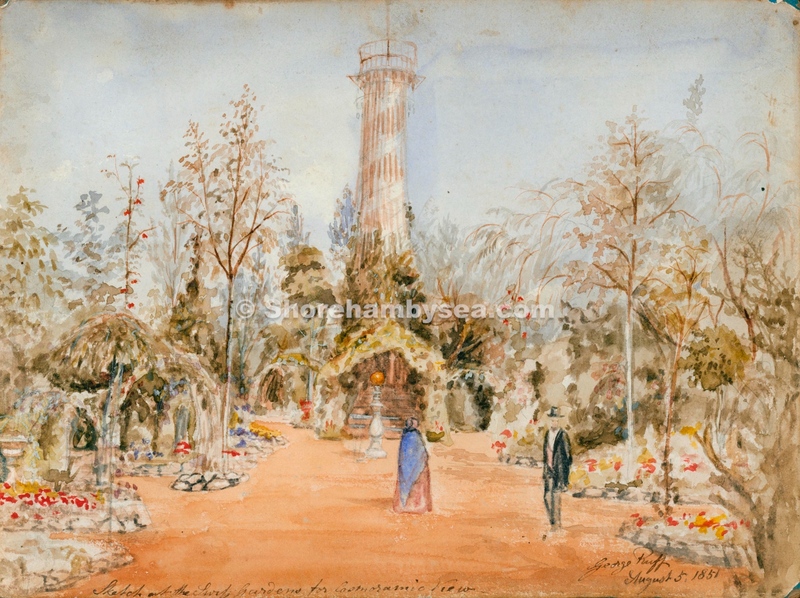 Watercolour sketch painted on card in 1851 by George Ruff. Observatory Tower in the centre. Trees and flowers. People in the garden. 91.1737 From the Sussex Archaeological Society’s Marlipins Collection. 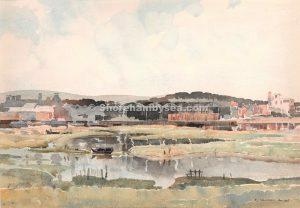 B38 River Adur and Shoreham-by-Sea. View from Shoreham Beach across River Adur in foreground towards New Shoreham town. 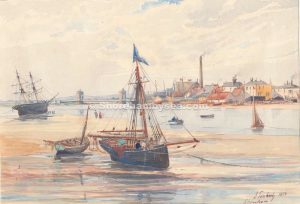 Rowing boat heading towards the Beach, two-masted ship moored at Dolphin Hard, several more sailing ships to the left near where Norfolk Bridge would soon be built. 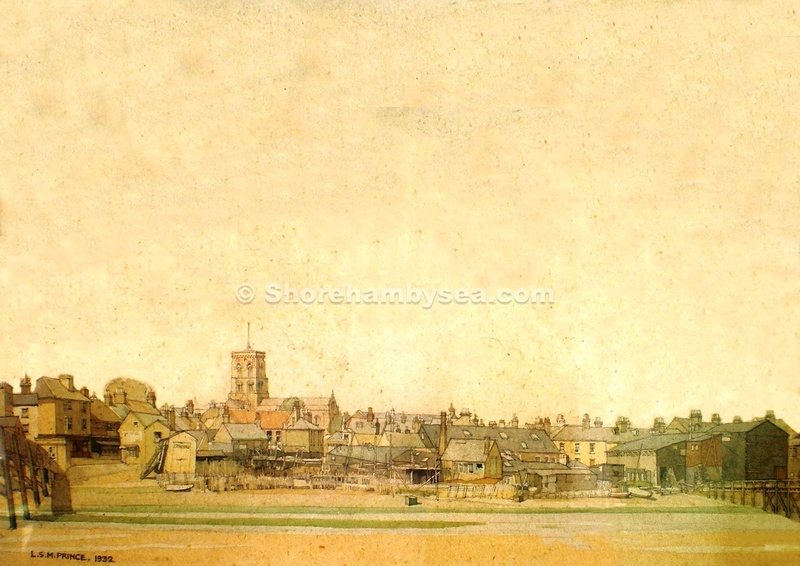 Parish Church of St Mary de Haura on right and other buildings along far shoreline. 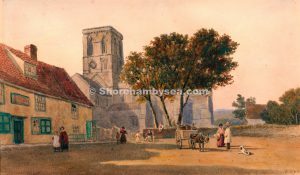 C.1830 artist john smith? 93.2142 From the Sussex Archaeological Society’s Marlipins Collection. B39 94.2402 Buckingham House, Shoreham-by-Sea. Watercolour painting by Miss E Bartlett. Showing the south and east elevations. Driveway leading up to the house and grounds. The house was owned by the Bridger family and then leased by Henry Head Esq. Signed EEB. From the Sussex Archaeological Society’s Marlipins Collection. B40 94.2404 Shoreham from Mill Hill, Shoreham-by-Sea. Watercolour painting. ‘Cockeroost’ area is on the left. St Mary de Haura Church in the distance. Norfolk Bridge is on the distant centre. 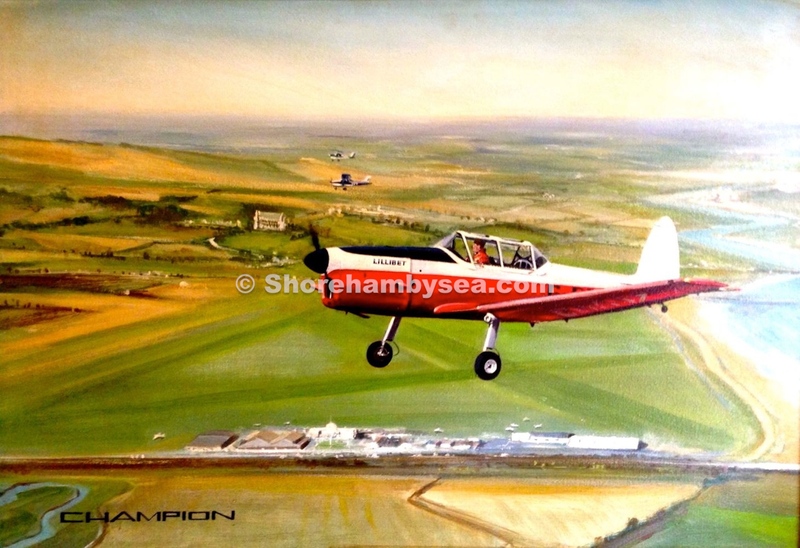 English Channel is in the background. 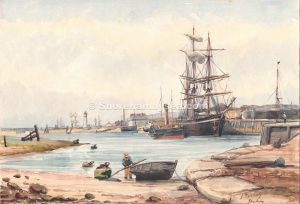 C.1880 unknown artist. From the Sussex Archaeological Society’s Marlipins Collection. 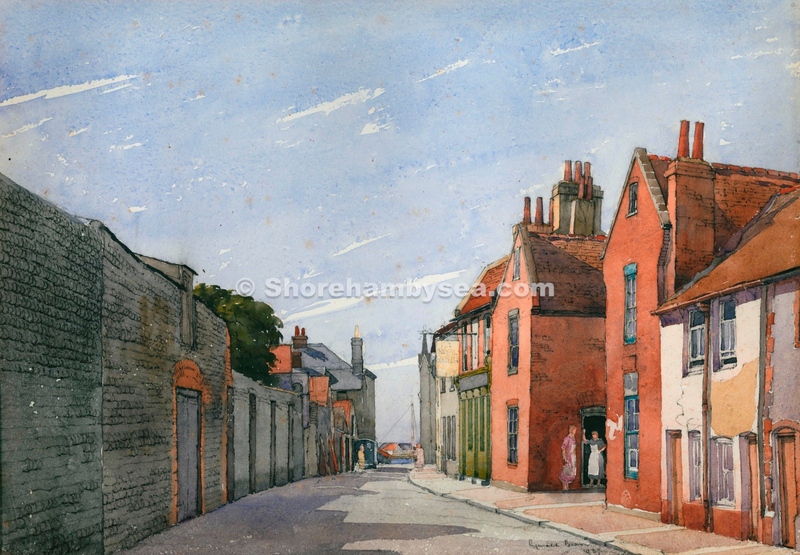 B41 S2 Upper Shoreham Road, Shoreham-by-Sea, looking east with Buckingham House lodge on right. Two horses, one with rider. On left fence surrounding trees marks the top of Buckingham Road. 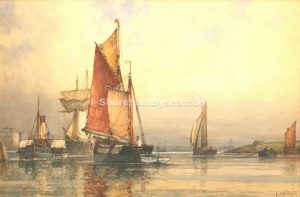 Artist Brrok Harrison Signed in lower left corner. C.1907. From the Sussex Archaeological Society’s Marlipins Collection. 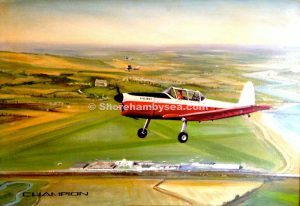 B43 02.3270 Shoreham from Bungalow Town, Shoreham-by-Sea. 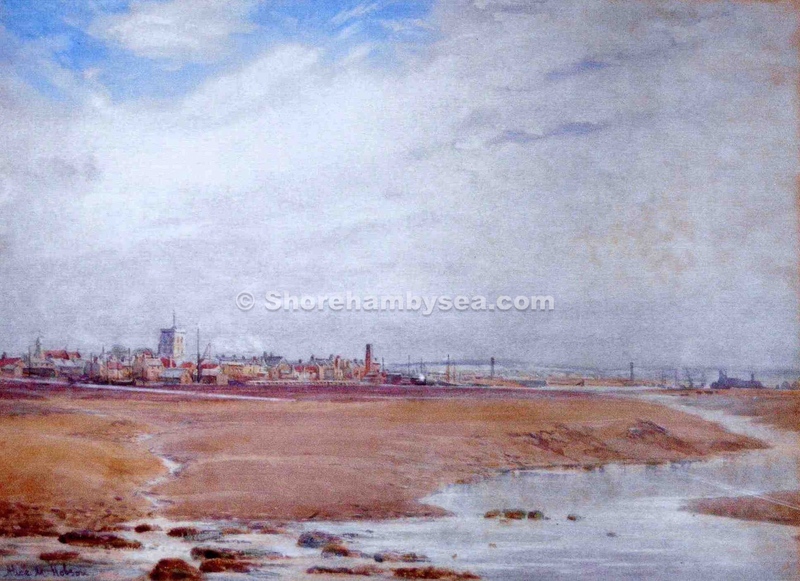 Watercolour painting of Shoreham Beach showing St Mary de Haura Church. 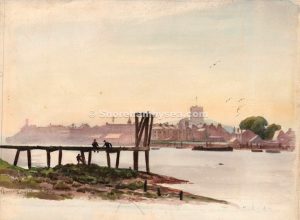 Wooden jetty in the foreground on the south side of the River Adur. Artist unknown. May 1928. From the Sussex Archaeological Society’s Marlipins Collection. 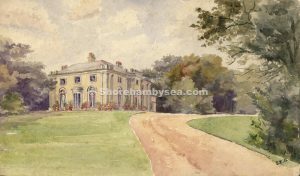 B44 S3 Buckingham House, Shoreham-by-Sea. View across lawn to trees in background. 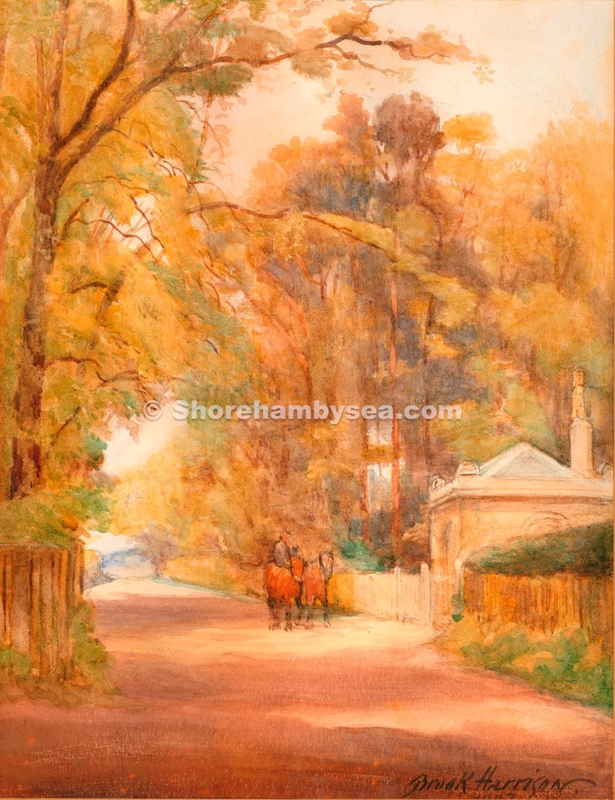 House partly visible on left, horse-drawn carriage with driver in top-hat. Signed in lower left corner. 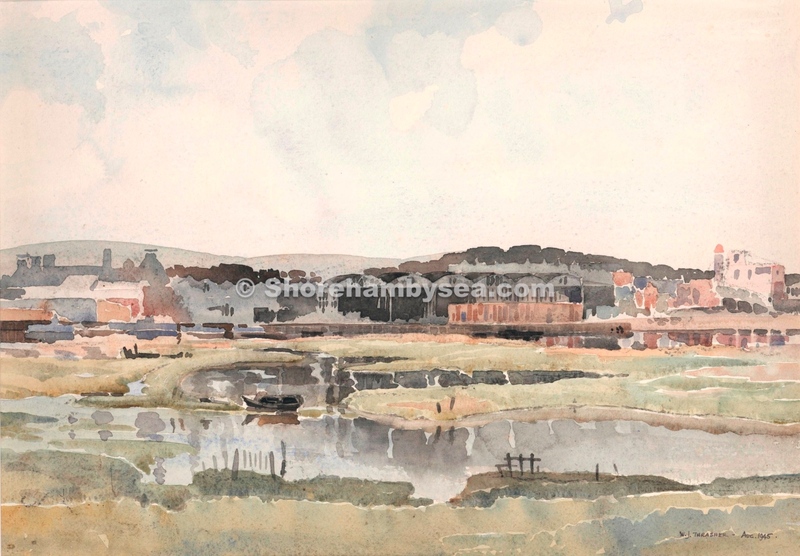 Artist Brook Harrison c.1904. . From the Sussex Archaeological Society’s Marlipins Collection. B45 S6 Two Houses in John Street (formerly St. John’s Street), Shoreham-by-Sea. View across street to one flint-faced house with sash windows and porch, and one brick house with sash windows, woden picket fence in front, stone walls either side.Artist Brook Harrison September 1926. From the Sussex Archaeological Society’s Marlipins Collection. B46 S.11 Red Lion Public House, Steyning Road, Shoreham-by-Sea. Watercolour painting of the Red Lion by Brook Harrison. View from the south west. St. Nicolas Church tower in the background. Houses and cottages with tall chimneys. 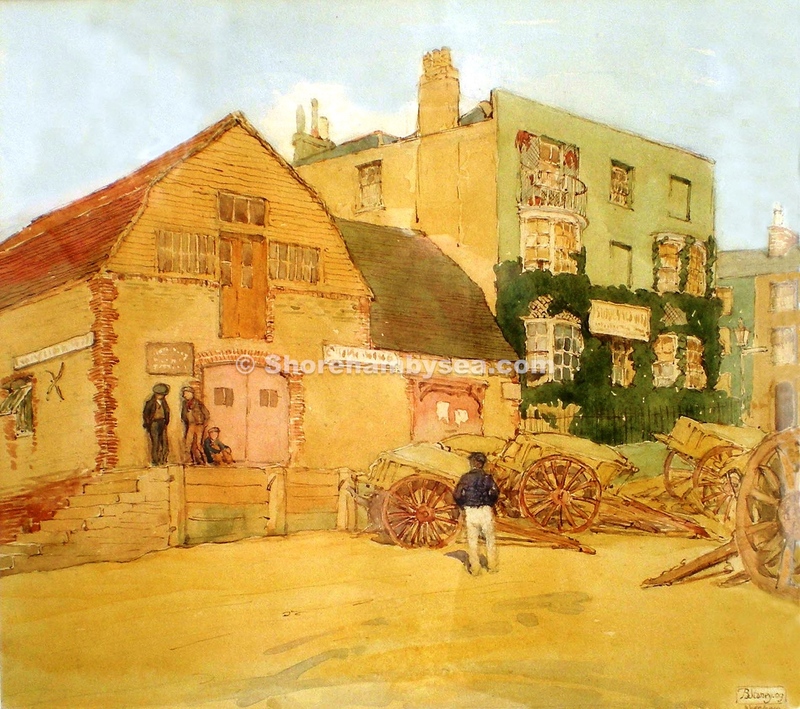 Horse and cart in front of the pub.c.1900. From the Sussex Archaeological Society’s Marlipins Collection. B47 S13 Rural Scene, Southwick, near Shoreham-by-Sea. Oil and canvas. Artist unknown. View looking westward from Fishersgate. 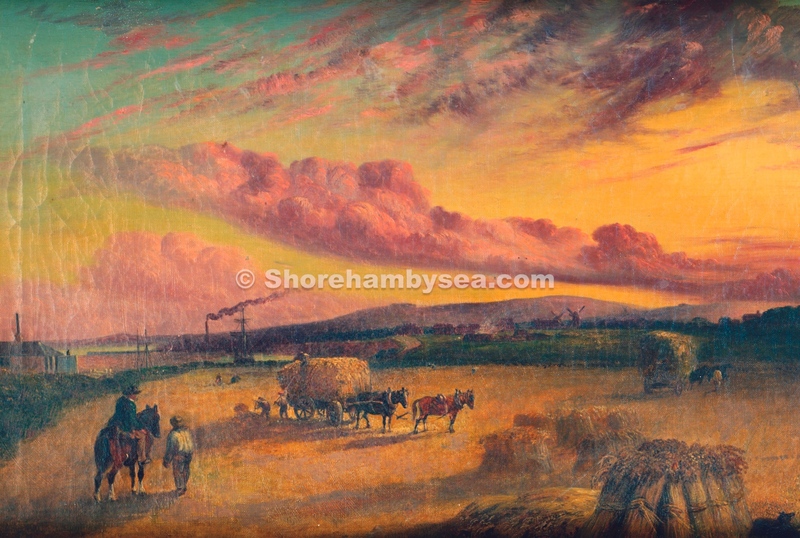 Rural scene at the end of the day where the last of the sheaves are being loaded onto the wagon. Farmer on the left is on horseback, overseeing the work done by this workers. Sheepdog by the sheaves of corn. Two windmills in distance. Brick kiln in middle distance. 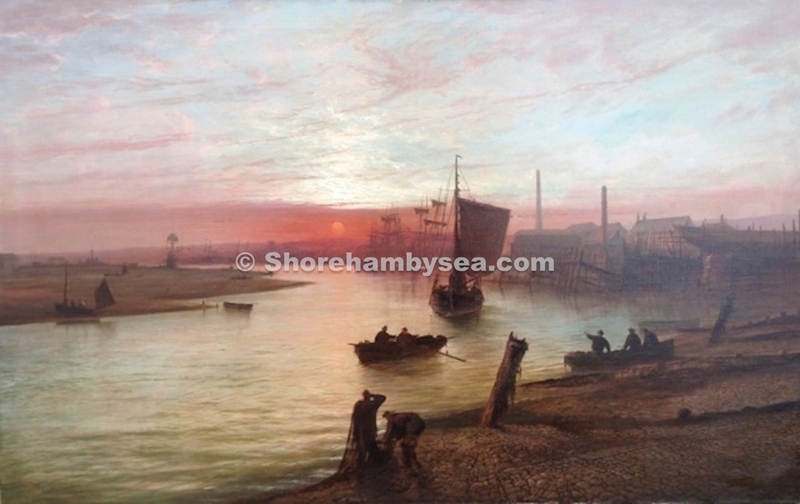 Tall masted ships at anchor in Shoreham Harbour. 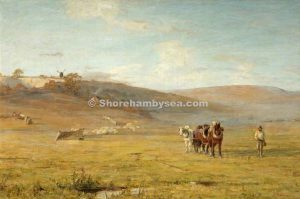 Horse and cart in the middle ground of the landscape. Building on the left. Shoreham Town is to the west. Sussex Downs in the background. Visible surface paint cracks on the canvas. C.1860 artist unknown. From the Sussex Archaeological Society’s Marlipins Collection. B48 S16 Mouth of Shoreham Harbour, Shoreham-by-Sea. 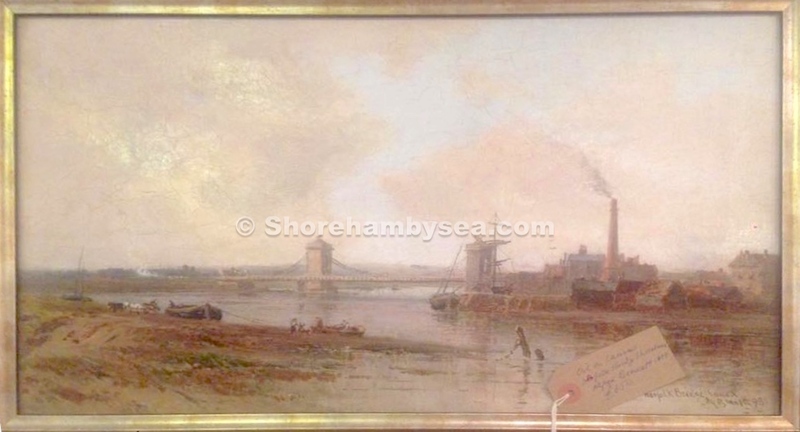 Watercolour painting, possibly by George Stanfield Walters? Two Masted Barque Sailing ship and paddle steamship ‘Stella’ entering the harbour. Ferryman with passenger in a rowing boat in foreground. Fishing boat. 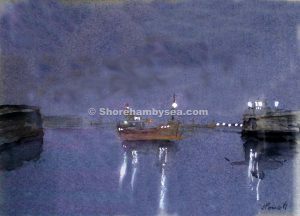 Navigation lights and Storm warning. 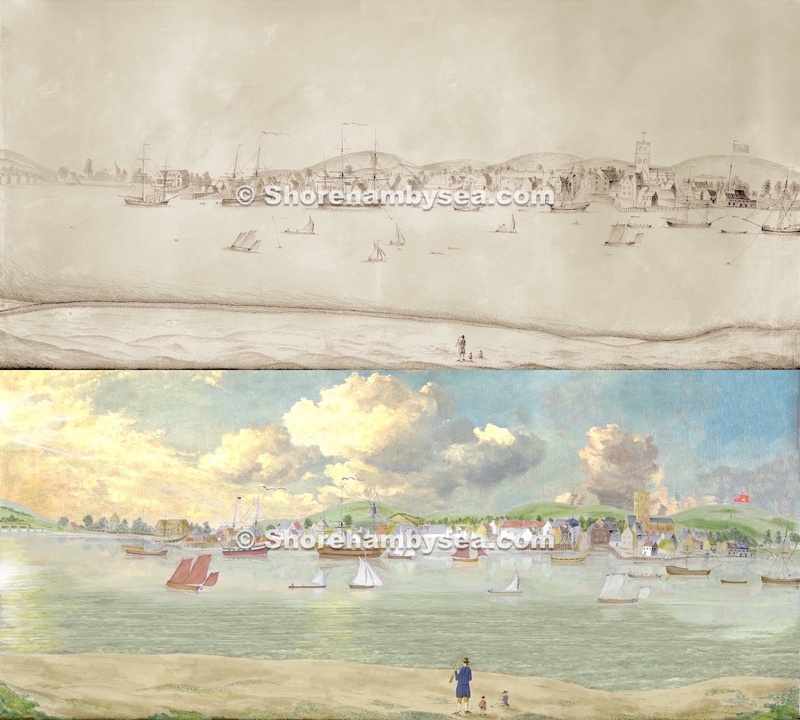 Buildings on the right on Shoreham Beach (Soldiers Point). Wooden jetties. Unsigned. 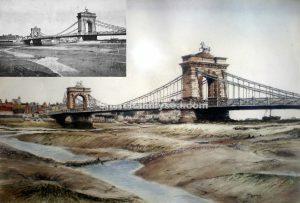 C.1891. From the Sussex Archaeological Society’s Marlipins Collection. B49 S20 New Shoreham Church, ‘St Mary de Haura’, Shoreham-by-Sea. 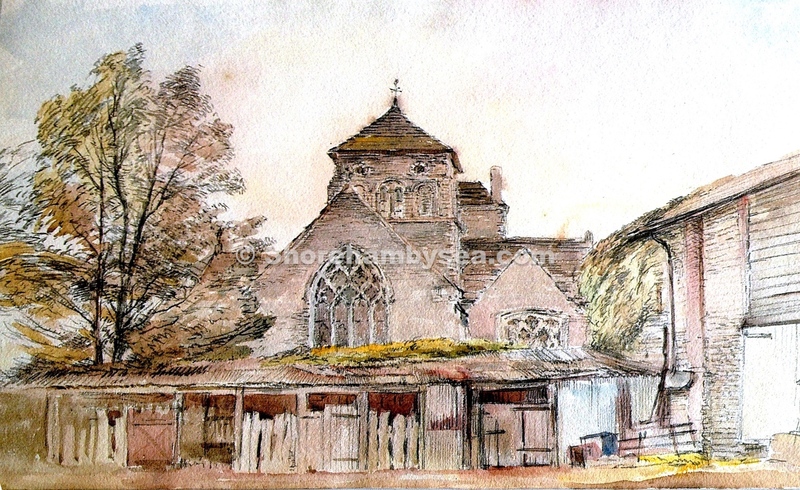 Watercolour painting by F. Nash (1782-1856) of the south side of the church from East Street. Signed on the bottom right. 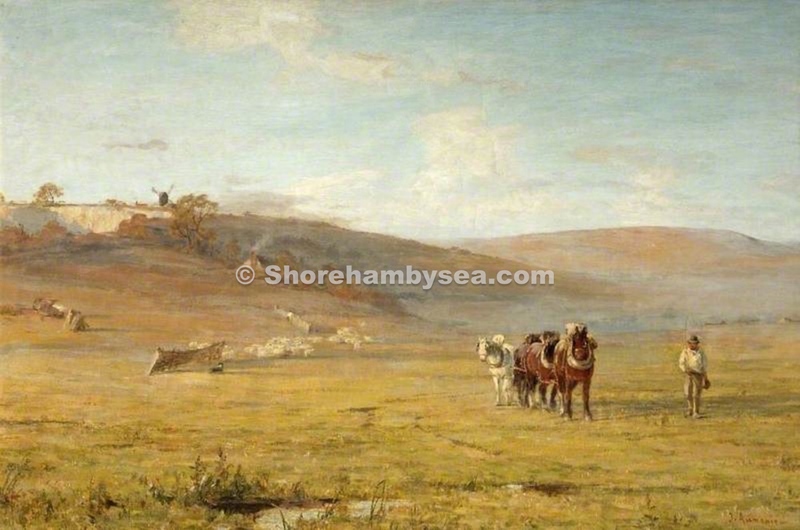 Horse and cart with a shepherd on the right. People are around the town. Children playing. Cottages on the left. Tree in the centre of the landscape. South Downs in the background.c.1850. From the Sussex Archaeological Society’s Marlipins Collection. B50 S21 Middle Street, Shoreham-by-Sea. 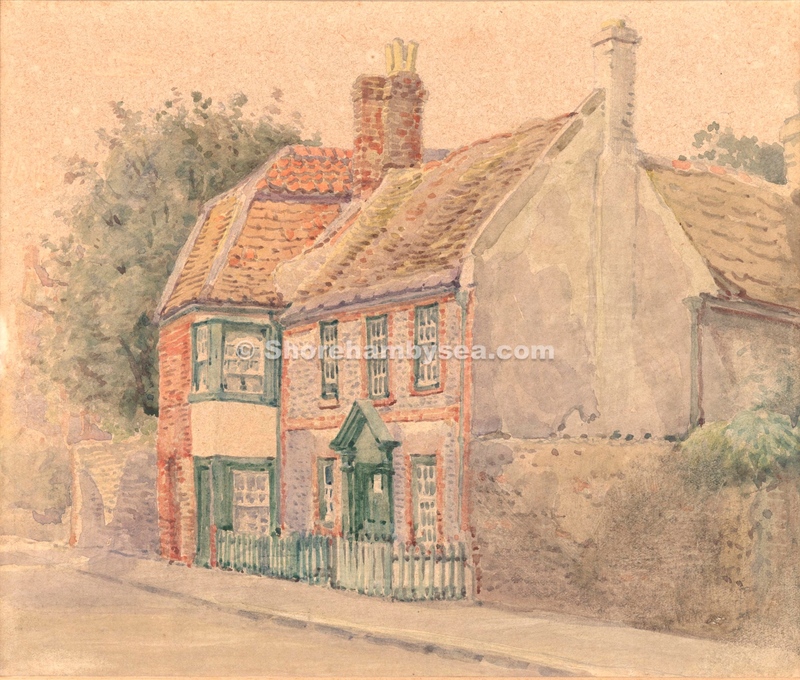 1937 Watercolour painting by Reginald Brown. View of the southern part of the street towards High Street. Royal Sovereign public house on the right. The Twitten is on the right between the houses. Women are standing at a door. Methodist Chapel in the distance. Sailing boat on the wharf of the River Adur. Signed and dated on the bottom. From the Sussex Archaeological Society’s Marlipins Collection. B51 S24 Sussex Pad Inn, Lancing. 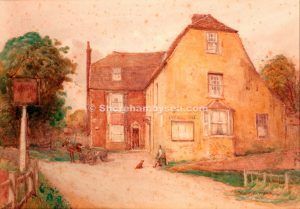 Inn sign in left foreground reads The Sussex Pad Inn J. Wood”. Inn has bay windows sign on wall “Carriages Hire” above a noticeboard. 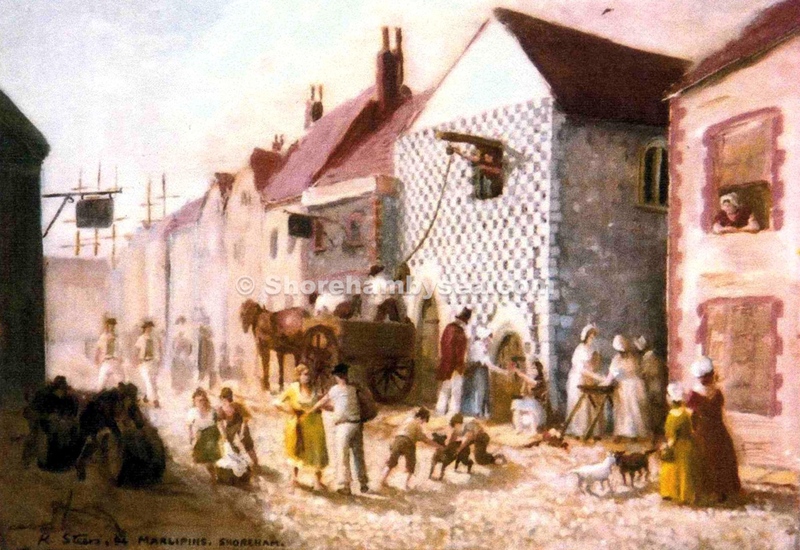 Loaded horse-drawn cart in front of inn man leans against wall with dog sitting in front. The Sussex Pad Inn was situated on the Lancing Road now A27 c.1895 artist Brook Harrison. From the Sussex Archaeological Society’s Marlipins Collection. 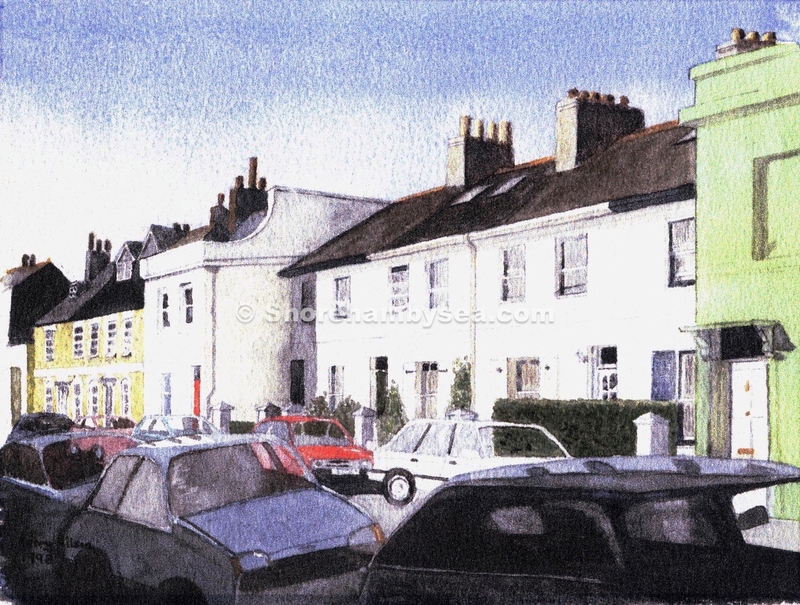 B52 S37 Middle Street, Shoreham-by-Sea, looking north with row of houses on west side of street. House in foreground is brick with tile roof, variety of chimneys on other houses. 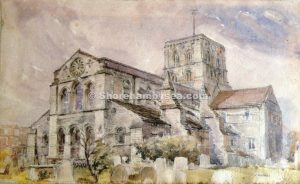 Unfinished watercolour by Michael W. D. Norman. From the Sussex Archaeological Society’s Marlipins Collection. B53 S39 View from south side of River Adur towards theBeves’ Wharf at Kingston. 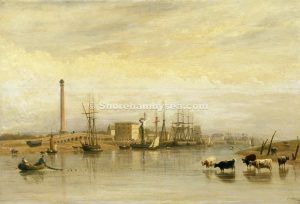 South bank in foreground, small boat moored in centre, buildings of Kingston in background including Kingston Maltings on left and lighthouse on right. South Downs on skyline. 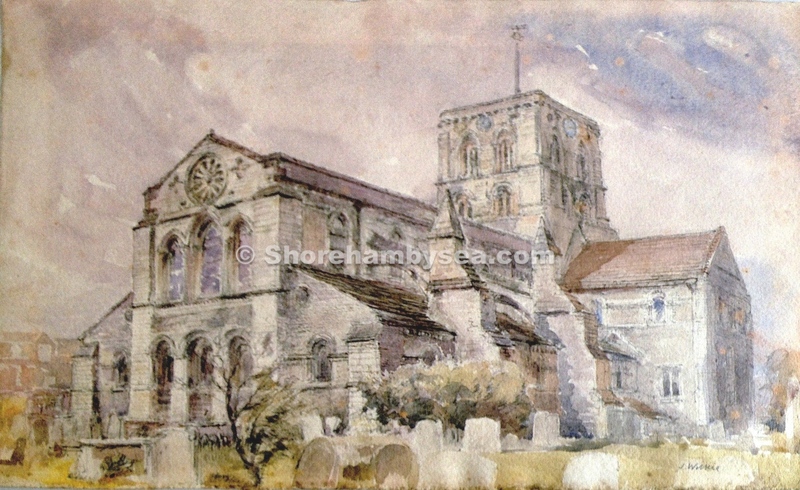 Watercolour by W. J. Thrasher, FRIBA, Archt.1945. From the Sussex Archaeological Society’s Marlipins Collection. B54 S40 Norfolk Bridge, Shoreham-by-Sea. Watercolour of the second Norfolk Bridge by Reginald Brown. Yachts. Buildings on the right. One man sitting on a bench on the right, another standing looking out. Signed and dated.Reginald Brown 1938. From the Sussex Archaeological Society’s Marlipins Collection. 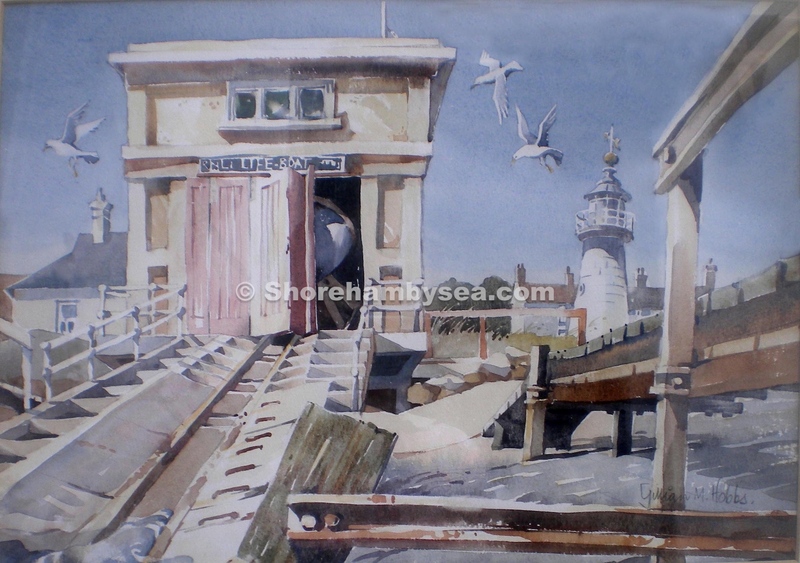 B55 S44 Old Shoreham Toll Bridge, Shoreham-by-sea. Watercolour painting (part) by Richard Sayers. Signed on the bottom right (not shown on scanned image). View looking east. Bridge over the River Adur. St. Nicolas Church in the distance. 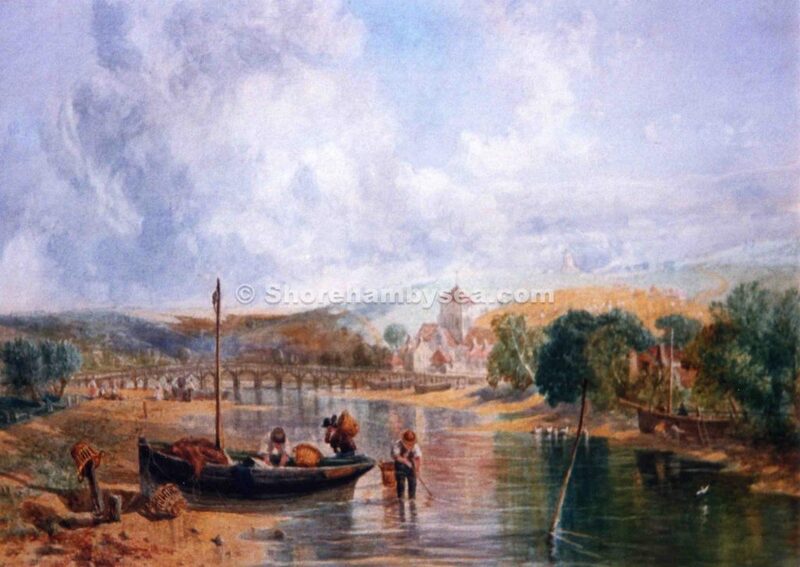 Man on river in rowing boat. women on the left carrying baskets. South Downs on the left. 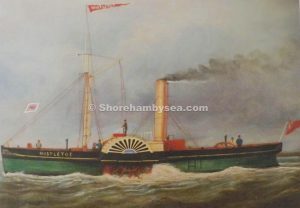 C.1890 . From the Sussex Archaeological Society’s Marlipins Collection. B56 S46 Mill Hill, Shoreham-by-Sea. Watercolour painting. 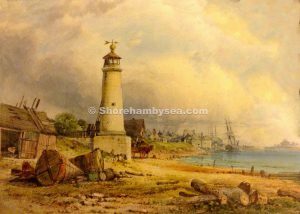 The wooden mill was erected in 1766 and burnt down in c1889. Horse plough in the foreground. Cottage beside the windmill. 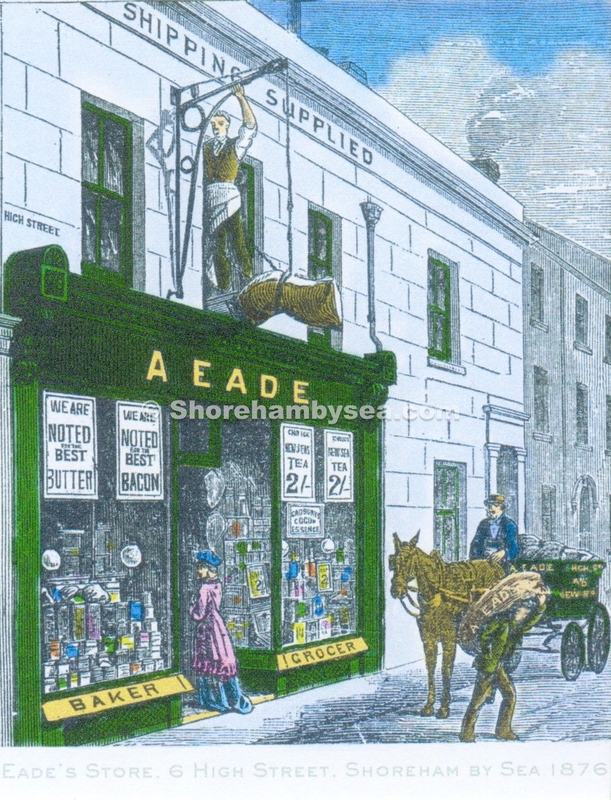 Horse and cart on the left. 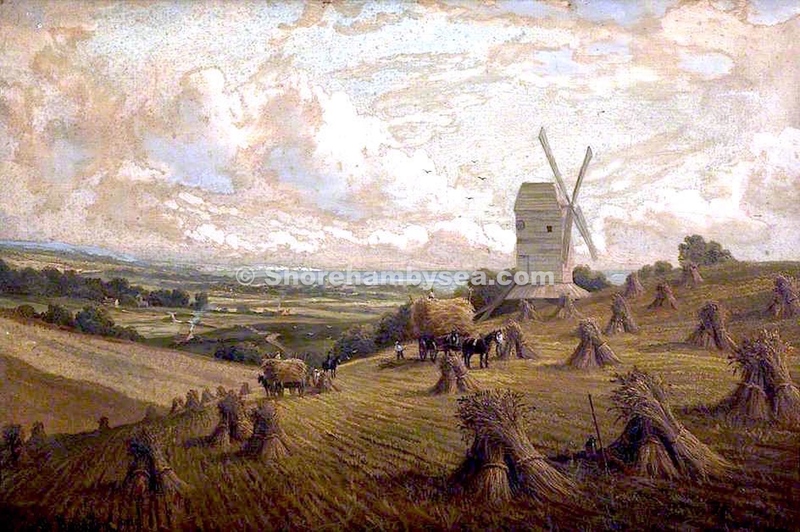 Artist Brook Harrison c.1885. From the Sussex Archaeological Society’s Marlipins Collection. B58 Hangleton Manor. 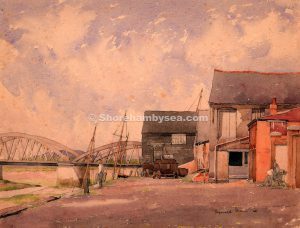 Although not a painting of Shoreham it is of a nearby neighbourhood and, in any case, is owned by a Shoreham resident which is a good enough excuse for us to include such a superb work of art on our website. The view is looking south from the hill above Hangleton Manor which can be seen in the near distance. It would seem the artist worked from a point near Hangleton Green, just below St. Helen’s church. 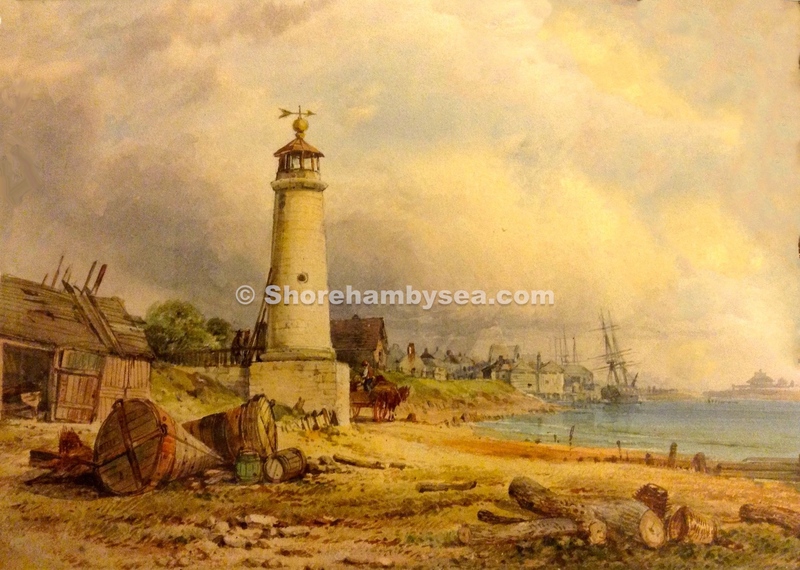 Use the magnified image to fully enjoy the quality of this painting. 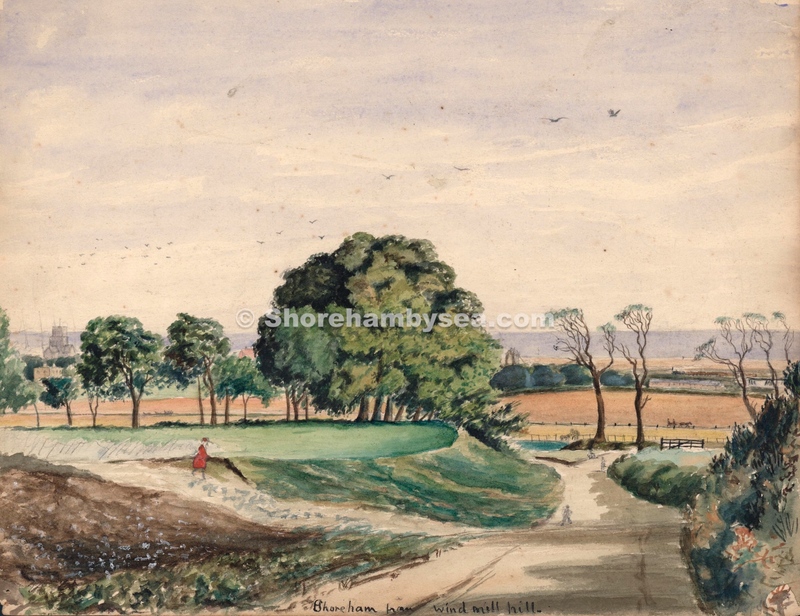 Notice also the far, middle distance where the southern part of Portslade including Aldrington can be seen with the spire of St.Leonards on the left and the Copperas Gap windmill on the right. A blissfully rural scene in 1904 that is now completely covered by housing. Little is known of the artist Sidney Goodwin but if current research brings any information to light it will be included here. Dimensions 43″ x 31″ approx. 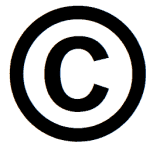 Photograph copyright Paul Everest. B59 A delightful view from Hill Barn Farm in the foreground towards Lancing windmill and Shoreham in the distance. Now part of a popular walk and a view that can still be enjoyed this painting was completed only a few years before the mill was demolished in 1907 – if you look closely even in 1902 the sails of the mill are fairly dilapidated. 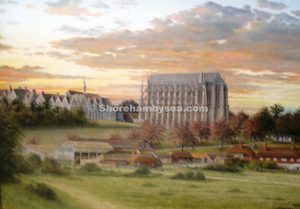 The chalk quarry can be seen to the front of the mill and the towers of Old and New Shoreham churches are visible as is the old suspension bridge. 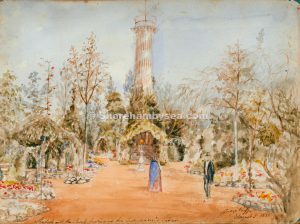 Painted by Sidney Pike who exhibited his paintings from 1880 to 1907 – we are having difficulty trying to discover more about the artist and if anyone has any information we would be grateful to know of it. 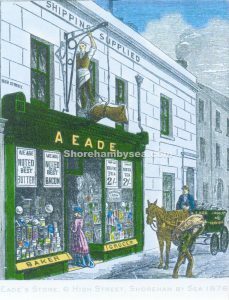 B64 Eade’s Shop, High Street 1870’s Not a painting of course but an 1870’s advertising print that deserves its’ place, not only as a colourful addition to the gallery but because of its’ rarity. 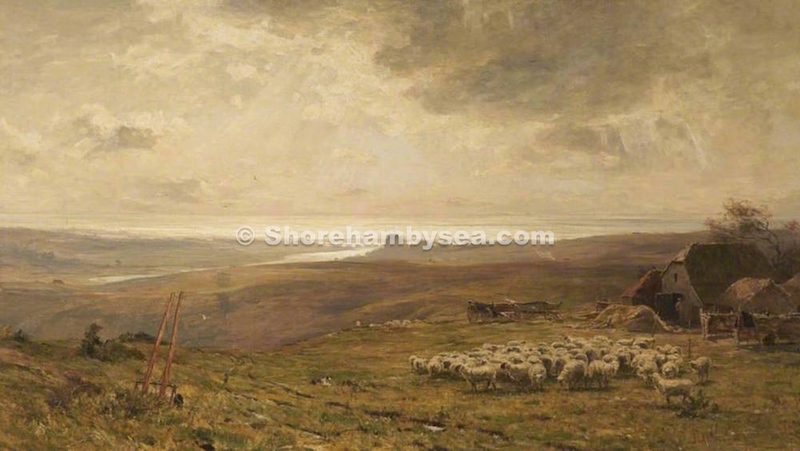 B65 Shoreham 1888 by James Webb. Currently stored at the Shoreham Civic Centre but, following the Adur Council’s move to Worthing may now have an uncertain future? 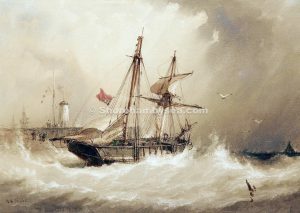 Nibbs (1816–1893) was an English painter and book illustrator who specialised in marine art, born in Brighton, Sussex and educated at a school in Worthing (run by the father of watercolourist Henry Tidey). 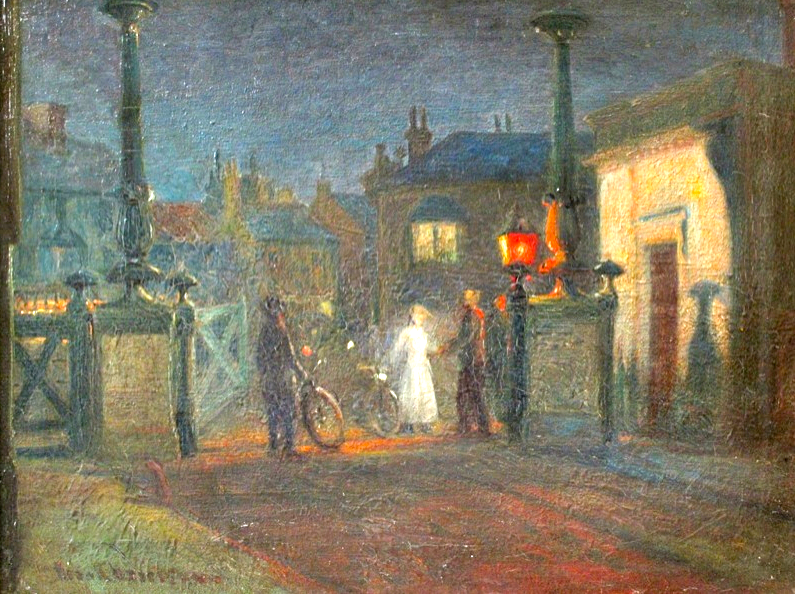 He lived in Brighton throughout his life. Nibbs initially trained as a musician and became a professional cellist with the Theatre Royal orchestra. 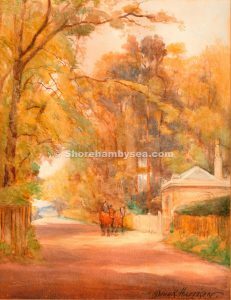 However, a lifelong love of art combined with a natural talent for detailed observation led him to become a self-taught painter – in both oils and watercolour – particularly of marine subjects. In 1840 a substantial inheritance allowed him to devote himself full-time to art. 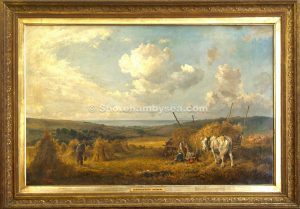 B79 Artist is Frederick Nash and supposedly dated 1835. 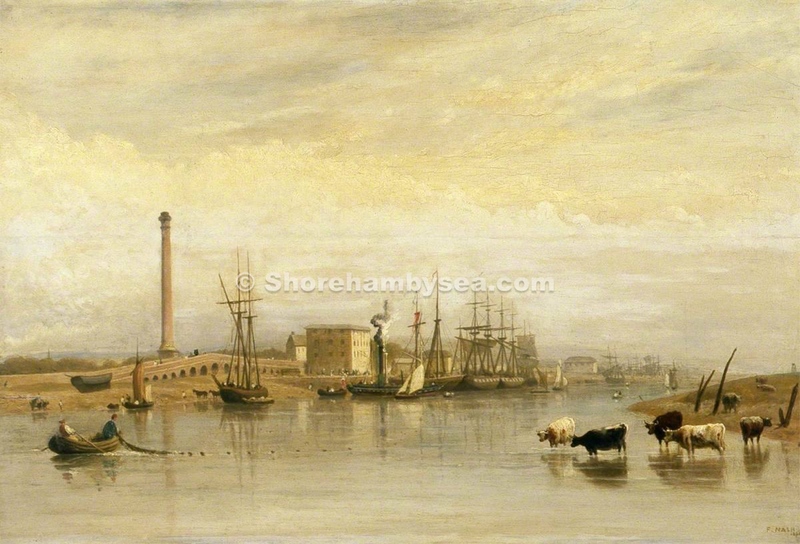 The year is likely to be incorrect though as records show that the Brighton Road viaduct (shown in the painting) was not built over the line connecting the Kingston wharves to the main railroad until 1840. B80 Shoreham port steam paddle tug ‘Mistletoe.’ The ‘Stella’ and the ‘Mistletoe’ were two of the best known steam paddle tugs that worked in Shoreham port. Artist unknown. 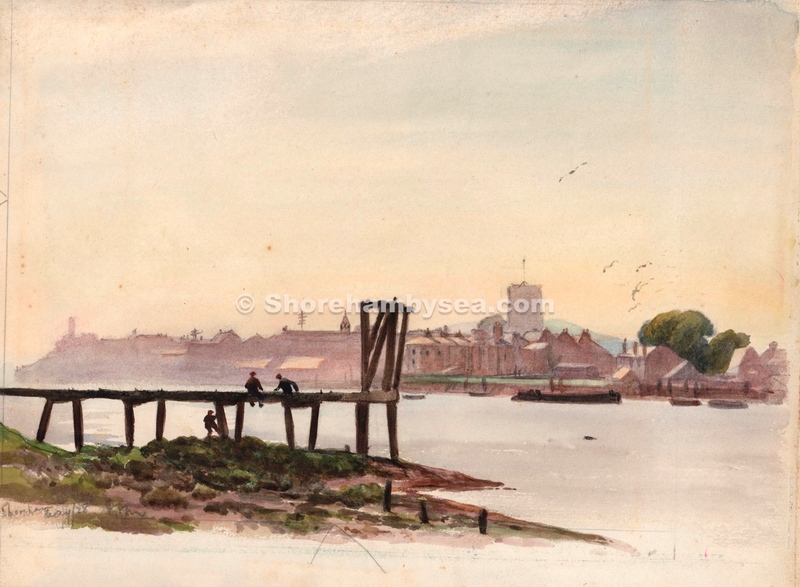 B81 Old Shoreham toll bridge looking north-west by Walter Stuart Lloyd. 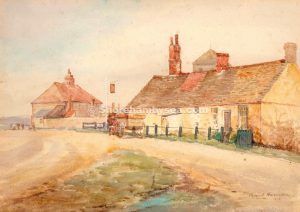 Dated 1904.The Sussex Pad is in the distance, left; Lancing College on the hill and a cottage is depicted below it where the Ricardo factory is now. The latter seems to be artistic licence as there were no buildings on that spot at that time. 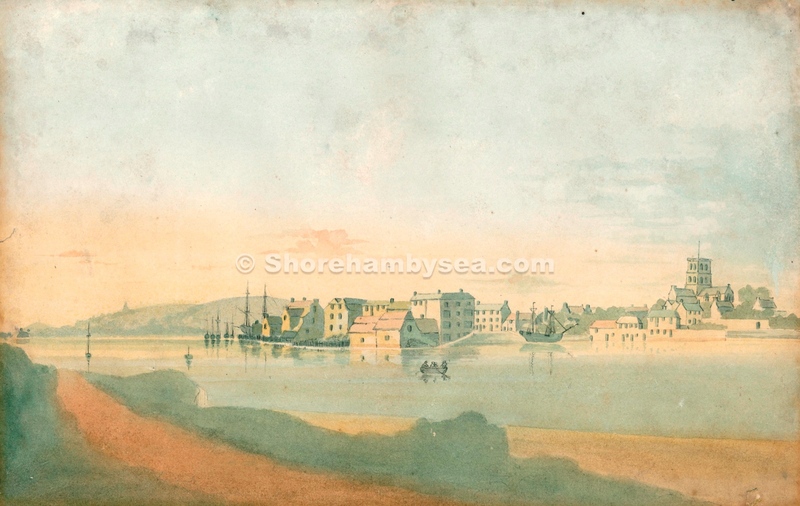 B83 Despite the apparent naivety of Captain John Butler’s 1786 sketch of Shoreham’s river front it is far more accurate than it seems. 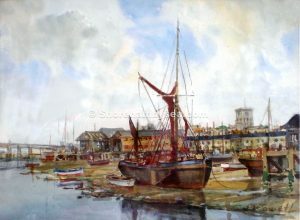 Described in detail in http://www.shorehambysea.com/john-butlers-1786-sketch-shoreham-examined/ his original sketch is made a little more lively by this coloured version using present day computer programmes.